on a platform formed of animal heads. human figure on this scale. Method: 15 steel beads were made and then threaded onto an iron core. Subject: Geometrically shaped beads stretching towards the sky. Reason: This sculpture was created in memory of the Romanian soldiers who died in World War 1. It forms an ensemble with 2 other pieces, the Table of Silence, and the Gate of the Kiss. performances in the winter ceremonial season. Reason: This display was made to create a unique environment that consists of eternity and neutrality. The contrast between the fluorescent lights and the wall emphasizes the darkness. The lights are bunched together to highlight the colors as intensely vivid. As stated by Robert Smithson, “Flavin turns gallery space into gallery time.” Dan Flavin displayed his unique style through his Puerto Rican Light, where it is stressed that the piece can disappear at any moment when the light switch is turned off. Reason This idol was created for funerary purposes. The reason for this belief is because the way the feet were positioned indicates that it was not meant to stand up. The size is no more than three centimeters long and was created from bleached white rock. The idol is very primitive, carved into geometric shapes such as triangular noses and flat ears. The interesting and artistic thing about this piece and other marble idols from the time were that they bear no anatomical resemblance to an actual human body, making it very abstract. 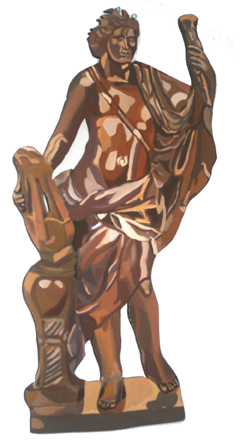 This idol was one of the first at the time to be created using simple proportions based on relationships between the different parts of the body.